The story of a perfect world gone astray, and of the God who stops at nothing to rescue that world and the people who inhabit it. In a style both illuminating and entertaining, the author recounts highlights of the multilayered saga of salvation from Genesis to Revelation. Seamlessly woven into this gripping drama are profound Christian truths shared by all the faithful. This book is for anyone, from seeker to scholar, who has ever wept for a broken world, who has tasted pain and passion as a partner in the human plight, who has glimpsed a glory as yet unfulfilled and sensed that there is more to come. 238 pages, soft cover, $14.99 plus S&H. On Sunday, May 16, 2010, Edward was interviewed in the 500+ member Biblical Literacy Class of Champion Forest Baptist Church, Houston, Texas, by class teacher Mark Lanier, with some questions to Sara Faye as well. To see original full-length video production of interview, click here. Major online booksellers depend on readers to rate the books they read for others who might be interested. 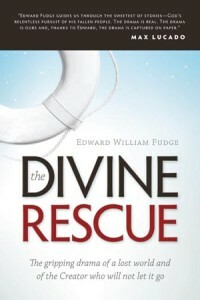 If you have enjoyed The Divine Rescue, would you share your thoughts about it with others who do not yet know about it?